On 14 September, “Aregak” bakery and coffee shop opened its doors in Gyumri to discover the potential of young people with disabilities, to create inclusive environments, and to promote visibility and understanding. The bakery will also provide Gyumri with delicious breads, pastries, and coffee. The opening took place in the framework of the “First Inclusive Bakery and Coffee Shop in Gyumri” project. Co-financed by the European Union, the Austrian Development Cooperation, and Caritas Austria, the project has been implemented by the Emili Aregak Centre of Armenian Caritas. Emili Aregak is Gyumri’s primary support and resource center for young people with multiple disabilities. 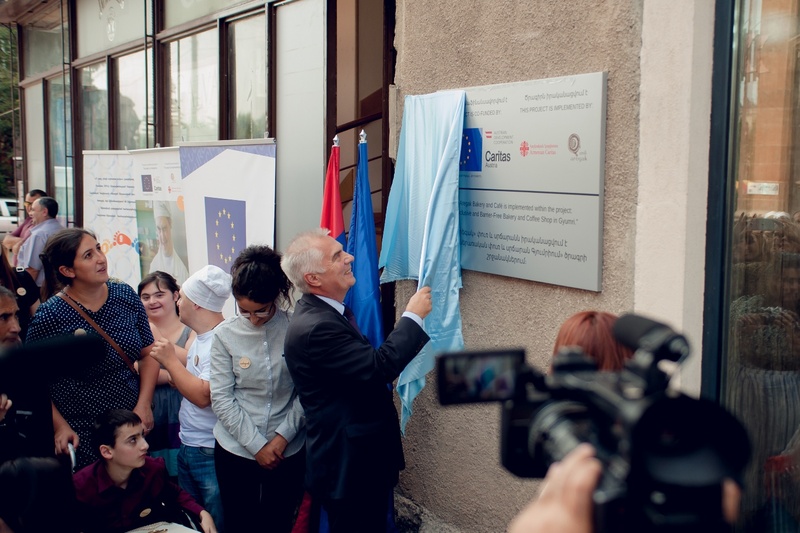 The Head of the EU Delegation to Armenia, Ambassador Piotr Świtalski, thanked all the supporters of the project: ‘We are deeply committed to empowering people with disabilities. Europe believes that the idea of second-class citizens has no place in our societies. Everyone must feel equal. We would like to see Gyumri as an example of an inclusive city’.